Great day on Baker with Louie. Climbed Colfax Peak via E ridge and skied NE Face around 1130am on perfect, ~1'' ski penetration corn. I'd been unable to find record of anyone skiing this line and we arrived to see two tracks down the face apparently from within a couple days. Left some big, freeride-style turns, too. Nice work, whoever you are. 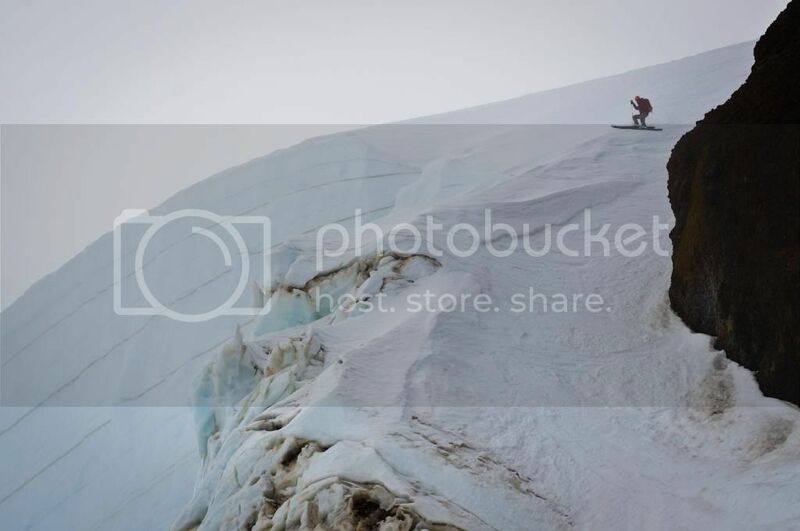 Buzzing off these incredible steep turns, we regrouped on the Coleman and ascended to top of Thunder Glacier Headwall. Dropped in from the top -- W aspect meant the high slopes were still icy, the lightly runneled face below was just softening, and the glacier proper held just-ripe, purrfect large-grained corn. More hoot-worthy skiing followed to appx. the terminus of the glacier, with the snow finally turning sticky around 6,200'. Roundabout skintrack heading N-NW to avoid steep, hot slopes, and then back E to the top of Heliotrope/Grouse Creek. Good final run into Grouse, a bit gloppy but much more consolidated and skiable than in previous weeks. Notes: Road mainly snow-free and drivable to overlook pullout about 200m from trailhead. One large downed tree blocking passage for tall (camper/trailer) vehicles a bit lower, though most vehicles fit underneath.� Grouse Creek still filled in but melting fast, and forest between parking lot and creek completely melted out already. Colfax about 10 days ago, passage around the ice cliff and the face are still appx the same, but the bergschrunds have opened significantly. Very steep through here. Very steep all the way, actually. I'd been unable to find record of anyone skiing this line and we arrived to see two tracks down the face apparently from within a couple days. Left some big, freeride-style turns, too. Nice work, whoever you are. If you ever find out who else was up there, I'd be interested to hear about it. 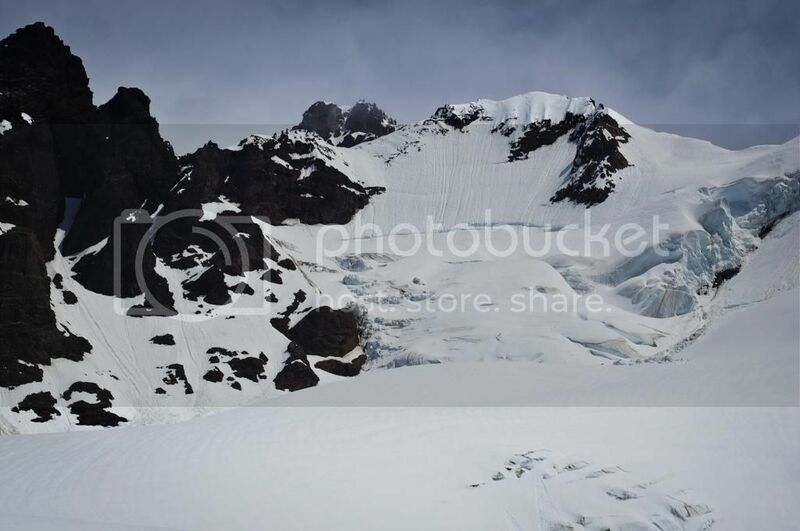 Looks like a pretty big 'schrund to air out at the bottom of the Thunder Glacier Headwall. 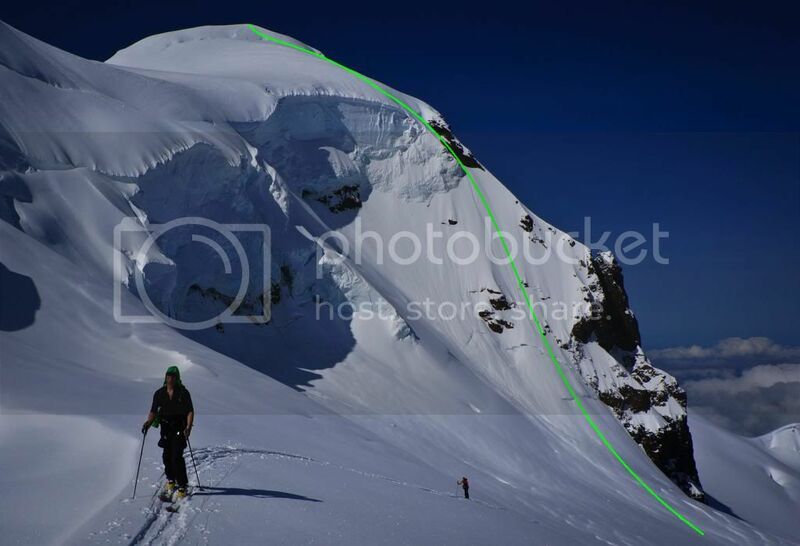 That's some mighty fine steep skiing you're doing! Myself and others have noted that the alpine (above 6,000 ft.) this year is much more open and exposed than normal. It would be wise to be careful in the alpine in the Baker area as the snowpack coverage is below average. Looking at the Thunder in early April I noted that it appeared quite different from years past. No problem for Drew and Louie! I�ve always looked at that line � so visible when climbing the CD. I believe it gets skied/ridden occasionally. A couple of years ago a local (Glacier) splitboarder (Woods, or something like that) told me he had done it. Last week (May 13) was the first time I had seen tracks down it. It seemed like they were from Mother�s Day or maybe the 12th so it looks like it has been skied at least a couple times this year. Does look steep. Nice work! Also had my eye on that Colfax line, must check it out more closely one of these days. Looks like a fun line, getting after it late season!